Whenever I hear the word “tradition” I can’t help but think of Tevye, the milkman in “Fiddler on the Roof” whose struggle to maintain his Jewish traditions was made even more challenging by the choices of his three older daughters. In the month of December, the word “tradition” in South Texas is all about La Tamalada or a tamale-making party. One of my very favorite memories of growing up in South Texas is of the Tamaladas that my beautiful mother would host in our home. The annual Tamalada was a big family and social event when our home was filled with extended family and friends who gathered to make tamales, empanadas, pan de polvo, and other Christmas goodies. It was a great time of the year to be a kid in our home because the house was filled with people we loved, with music, laughter and conversation, and the opportunity to sample lots of food. Tamales have been around for a long time. Bernardino de Sahagún, a Franciscan friar and ethnographer who came to New Spain (Mexico) in 1529, documented that the Aztecs served tamales to the Spaniards in the mid-1500s. We have traced our ancestry on my Dad’s side of the family to the 16th century, so perhaps our ancestors were among those who sampled Aztec tamales. The word tamale is derived from the word tamalii from the Nahuatl language spoken by the Aztecs. The word means “wrapped food.” However, the Aztecs were not the only people to enjoy tamales. Tamales were also a favorite food of the Mayans in Central America and the Inca in Peru. Warriors from all of these peoples survived on tamales because it was a portable food. My mother taught my wife Cheryl how to make tamales. Making tamales is a time-consuming, labor intensive, messy, and creative process but one that is worth the effort when that first batch of tamales is ready to be sampled. In keeping with tradition, Cheryl has hosted tamaladas in our home. My job is to sample the various fillings and making sure that the masa has the perfect taste. A Tamalada is hard work but fun. It takes lots of hands to soak, dry, and sort the corn husks, to prepare and spread the masa on each husk, and then to add the filling, tie and bundle each tamal (singular) and then finally steam all of the tamales. 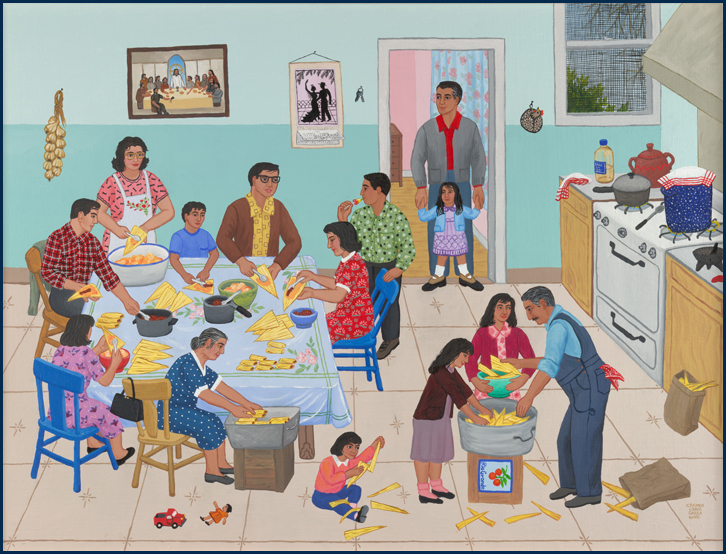 Because the process is so labor intensive, families that keep the Tamalada tradition make as many tamales as possible. And then, the best part — eating and sharing tamales at Christmas. Traditions are not all bad, especially those that keep us connected and grounded to faith and family. I hope that you will consider your Christmas traditions and help create memories that will bless and comfort your family and friends for years to come. And, whatever you do, be sure to eat plenty of tamales this Christmas. 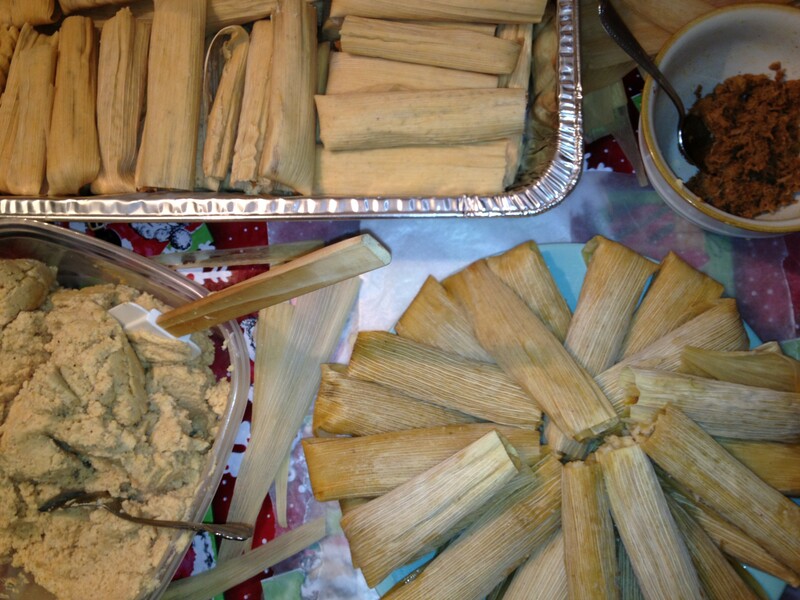 This entry was posted in Culture and tagged Carmen Lomas Garza, Christmas Traditions, Tamalada, Tamales. Bookmark the permalink. Omar; yes, this is a great tradition! I still remember my late grandmother cooking a version of Mexican tamales called “Nacatamales” wrapped in banana leaves. It brought the family together. I look forward to eating one of Cheryl’s tamales. Thanks for sharing this memory, Selim. Nacatamales sound delicious. You will definitely have to sample one of Cheryl’s tamales. Running a bit behind and just today reading this entry. It’s especially interesting because today I purchased our tamales from a cafe in Grand Prairie for Christmas Day. (I’m afraid if I attempted to make them, we would go hungry!) That has become a tradition for us. Whether you make or buy them, gotta love tamales at Christmas. Best wishes for a wonderful Christmas, Cathy!